Last Friday, I joined The Wedding Date and his youngest at his parents’ house for a round of Lords of Water Deep. What is Lords of Water Deep? Why I thought you’d never ask. Lords of Water Deep is the next step on my descent into total geekdom. In other words, it’s a board game… a “Euro” if you want to get technical. 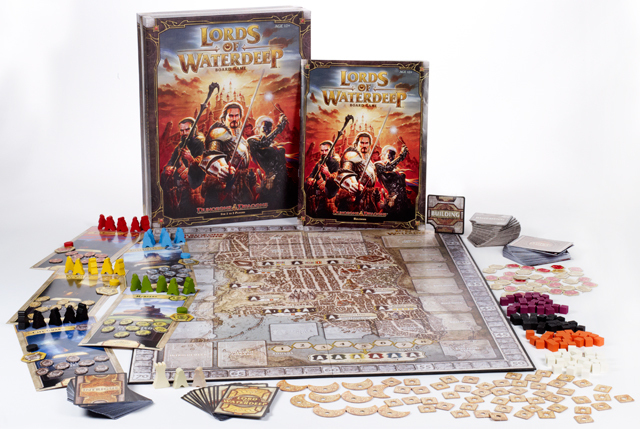 First it was Carcassonne, then cam Settlers of Catan and now finally Lords of Water Deep. The thing I like most about it is that you can tell when your opponents are scheming because you have to collect little wooden cubes that represent people and allow you to complete an assortment of non-violent and quasi-historical quests. But it’s not just the non-violence and the vague historicity that I’m into. It’s the fact that you can stick it to your opponent with a mandatory quest card that requires them to use their carefully selected cubes on an ill-advised goose chase, thereby draining them of their hard-earned resources in exchange for a mere two victory points. The Wedding Date is always scheming. And so am I. But I’m not just scheming about winning the game. I’m scheming about how I can keep him from winning the game. Sometimes I build alliances with his kids. Sometimes I just go on the offensive right out of the gate, even if it ends up costing me in the long run. Whatever my strategy, the goal is always the same: keep TWD from winning. And even though he didn’t start out this way, he’s gotten pretty vicious himself over the past few months. But on Friday night, something weird happened. His parents, who had never played the game before, started helping one another. Whenever they drew a card that gave them the option to bestow cubes upon another player, they chose each other. And wouldn’t you know… TWD’s mother killed us. She won by like 50 points, and she didn’t even fully comprehend the rules until the 6th or 7th round! I was amazed. In fact, I’d never seen anything like it and I’ve been playing board games for… well… at least eight months now. It made me wonder: TWD’s parents have been together for upwards of 30 years now. Clearly they’re doing something right. Maybe board game alliances are the real deal. I’m pretty sure my parents (who celebrated their 30th wedding anniversary earlier this year) would aim to clobber one another if they ever found themselves playing Lords of Water Deep but they’re just like that. When it really counts, they do have each other’s backs. So you tell me: when it comes to competitive activities (be it board games, mini golf or a nice friendly game of who-can-hand-out-the-most-bulletins-at-church) do you and your partner set out to destroy one another or do you work together? Isn’t that more or less Mitch McConnell’s strategy vis-a-vis our president? I think you’re on to something, Kat. We set out to destroy each other…lol. Seriously, we love competition…I think because we’re really great matches for each other. Scrabble, Scramble, Words with Friends, even mini-golf. But to qualify that a bit, we also work on puzzles together, cook together and love the same things when we travel. It’s a nice contrast to the competition. What, all this time among Quakers and you forgot about http://tinyurl.com/csmg8mp? But then, who am I to talk?! my Mum always used to make me and my sister play the “ungame” which hasn’t got a winner and is all lovely and affirmative. bloody waste of time and not much fun…! Hah! That reminds me… I have about three overdue “ungame” books from the Quaker library!!! Couples teaming up is quite possibly THE biggest board gaming faux pas. Give TWD’s parents a time out and see what they learn. Me: I get defensive, angry, frustrated, disrespectful, rude, distrusting, and upset when we play games. I do not want any of that in our marriage, not at all, anywhere, ever. Me: We can play to win AND not try to make each other lose. Let’s agree to be respectful, kind, supportive, and loving, no matter what happens in the game. It worked. We both win sometimes. No one feels upset or thrown under the bus. We can now celebrate each other’s wins.